Board your overnight flight to Beijing, China. Arrive in the ancient capital of China. As the political center of China for the past 800 years, and the world’s third most populous city, Beijing is rich in history with both modern and traditional architecture. Take your seat at an amazing acrobatics show. All aboard the Maglev train - reach speeds over 260 miles per hour! Interact with China’s national treasure at the Giant Panda Breeding Research Base. Experience China’s marvels, ancient and modern, rural and cosmopolitan, on this fantastic tour that features a relaxing 4-night upstream cruise of the Yangtze River. Discover for yourself the mysterious Forbidden City and the immense Tiananmen Square. Walk a section of the Great Wall, tour the old, narrow streets of Beijing by rickshaw and share lunch with a local family in their Hutong home. Stand before the 8,000 warriors in the life-size terracotta army in Xian. 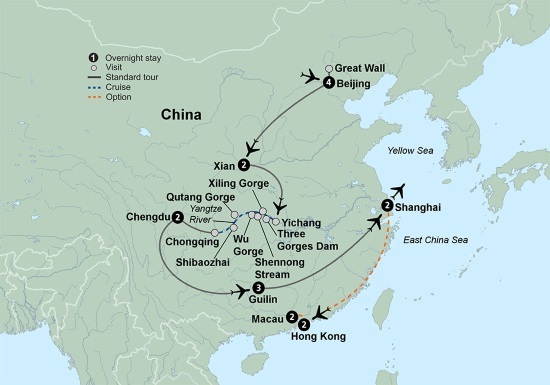 Float by the dramatic scenery of the Three Gorges and steep cliffs of the Qutang Gorge. Marvel at an acrobatic show. Interact with China’s national treasure at the Giant Panda Breeding Research Base. Try your hand at the art of Chinese calligraphy and perhaps take a tai chi lesson. Experience both old and ultra-modern China in Shanghai.